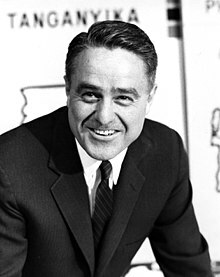 Sargent Shriver (natus in Vestmonasterii Terrae Mariae die 9 Novembris 1915; mortuus in Bethesda Terrae Mariae die 18 Ianuarii 2011) fuit rerum politicarum peritus Americanus. In petitionibus anni 1972 candidatus ad Praesis Vicariis Civitatum Foederatarum Americae munus ob factionem democraticam professus est. Die 23 Maii 1953 Eunice Shriver, praesedis Ioannis F. Kennedy sororem in matrimonium duxit. Vicimedia Communia plura habent quae ad Sargantum Shriver spectant.